Uzbekistan’s septuagenarian leader was inaugurated (again) Friday with little fanfare. The attendance of members of the CEC and Constitutional Court is nothing if not ironic. Karimov has sustained a staged version of democracy through a series of strategic constitutional changes and referendums by virtue of the fact that he holds absolute power in the country. Karimov’s election history is telling in this regard. 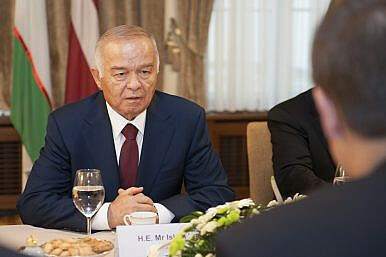 In 1990, Karimov first came into office as president of the Uzbek Soviet Socialist Republic. He then won handily Uzbekistan’s first election as an independent country in 1991. In 1996 he extended his term via referendum and was reelected in 2000 to a seven-year term. He delayed the 2007 election by a technicality until December, and then won despite a two-term limit in the country’s constitution. The argument then was that his 1991 election did not count as one of his two “consecutive terms” because it was before the current constitution was put in place in 1992. While the Constitution restricts the president to two consecutive terms in office, the incumbent is standing for re-election for the third time under the current Constitution… officials explained to the OSCE/ODIHR LEOM that the notion of ‘term’ means the exact number of years and, as the previous presidential term was seven years while the next will be five years, these cannot be considered as two consecutive terms. True, the Office for Democratic Institutions and Human Rights (ODIHR) has consistently cited the lack of competition, abuse of power, and obvious inconsistencies with Uzbek legislation during various elections past. However, the reports of foreign observers have changed nothing. After all, no report is strong enough to contend with the remarkable compatibility over a quarter of a century between the “popular vote” and the plans of the powers that be. For years, Karimov seemed odd and unpredictable to me. He was a fickle ally, potentially volatile, a bully who was condescending to fellow Central Asian presidents, brutally candid and politically incorrect, remorseless and unrepentant when confronted with evidence of the violence of his regime, easily insulted, and quick to exact vengeance for perceived slights. Karimov may be able to win perpetual presidential terms, but (while it is little comfort to Uzbek dissidents and exiles now) he will not live forever.